Water ice is an abundant material in the solar system. In the inner solar system, it plays an important role on both Earth and on Mars, where the cryosphere is a dynamic part of their respective climate systems. On the Moon and Mercury, water ice is likely cold-trapped inside permanently shadowed craters at the poles. In the outer solar system, water ice is a major constituent of many moons of the Jovian, Saturnian, Uranian and Neptunian systems, and of Pluto, asteroids and planetary ring particles. Further “ices” made up of other moderately volatile substances are known or presumed to occur, for example, on Mars (CO2), Io (SO2), Europa, Ganymede and Callisto (NH3), Titan (CH4 and other carbohydrates), Triton and Pluto (N2, CH4). The objective of this IACS Division is to promote research on the variety of ices in their different environments, and to foster active exchange between the planetary and terrestrial cryospheric science communities for mutual benefit. 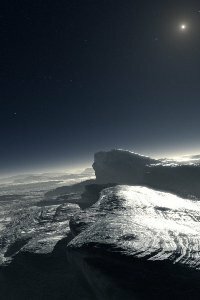 Artist’s impression of the icy surface of Pluto, with atmospheric haze and the faint Sun in the sky.